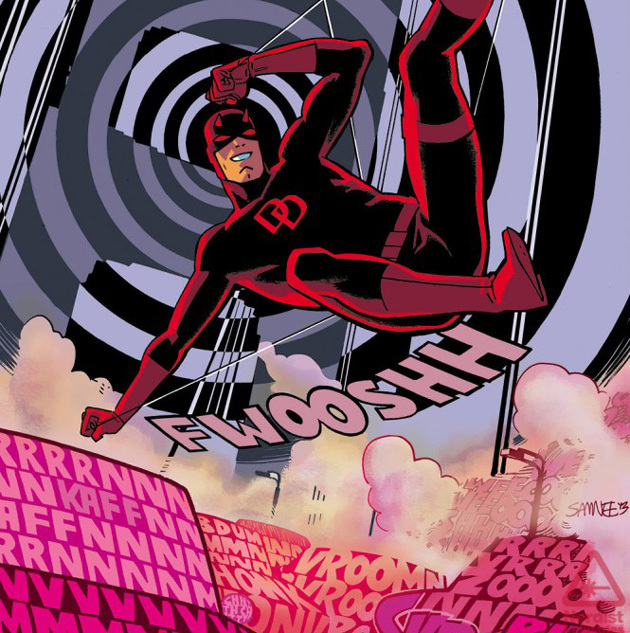 Waid, Samnee & Co. kick off new Daredevil series! Okay, so remember how I kept making the case that this probably wasn’t the last we’d seen of Mark Waid and Chris Samnee on Daredevil? Well, I’m happy to say “I told you so!” To be fair, I know many of you guys shared my suspicions, especially with the number of hints that Marvel and the members of Team Daredevil themselves kept dropping. In fact, I was surprised that so many people took the “cancellation” at face value in the midst of all the mixed messages. That’s not to say that I didn’t have my doubts, but I was pretty sure we were going to see something like this. So, what’s “this” all about? Well, it turns out that, starting in March of 2014, Matt Murdock will find himself back in San Francisco (where he spent a good amount of time in the 70’s), as the star of a new Marvel NOW! Daredevil series. The entire team, including Javier Rodríguez and Joe Caramagna, will reunite and things will pick up where they left off following the presumably earth-shattering events of Daredevil #36 (and the digital-only trek across the country by Mark Waid and Peter Krause). You can catch all the available details in this Nerdist interview with Mark Waid and Chris Samnee. So, how do you guys feel about this? Personally, I’m relieved that my gut instinct didn’t let me down. Secondly, San Francisco? I’m intrigued! Unlike some of the moves to other cities that Marvel has been plotting for their characters recently, this one at least makes sense. Matt has a history with the city, but isn’t as familiar with it as he is with New York where he was born and raised, so settling in might be an interesting challenge for him. I really hope Foggy is able to recover from his cancer, whether he is the one who gets to follow Matt across the country or not. The new series also appears to come with a new price point at $3.99, unless that’s just for the first issue. Personally, that doesn’t really bother me. Not because I’m rich (I’m not), but because 1) I only buy a handful of comics each month and 2) I honestly don’t understand how you make money selling comics of that quality for $2.99. Yeah, I know comics used to cost virtually nothing way back when, but I may be one of the few people who don’t think that comics are generally overpriced. If you count the cost of each minute of entertainment, I can see your point, but not if you count the hundreds of man hours that go into making them. Besides, volume three of Daredevil has shown that it is possible to pack a ton of stuff into each issue, which makes the cost well worth it. So, does that mean I’m all good? Well, no. I’ll be honest with you. Renumbering and relaunching makes good business sense for Marvel. You and I may complain about it, but I understand where Marvel is coming from. I really do. For every person who is now declaring that they’re done with Daredevil, there are probably just a few more that may now be more willing to give the title a try. However, I find the stuntiness (let’s pretend that’s a real world) of how the “cancellation” was handled on Marvel’s part to be pretty unclassy, to be frank. As a fan, I felt like I was being jerked around. The fact that I was pretty sure this was a ruse didn’t help matters, quite the contrary. While it’s true that my new position at work, and life in general, has made finding the time to blog more difficult recently, I’ve also been less inspired to. The news of Daredevil’s impending cancellation took the wind out of my sails to some extent and made me less excited about the character and what was happening to him. I would imagine that I probably haven’t been alone in this. All in all, I’m very excited about this news. I am. It was expected, but still a big relief, and I do think the concept for the new series seems interesting. Besides, I will stick with this character through thick and thin so I’m obviously going to be onboard for anything. But I do want Marvel to know that the things they do in an effort to increase excitement for a character and a creative team may very well have the opposite effect. As much as I adore the entire current creative team (and I obviously don’t fault them for Marvel’s marketing practices), I will admit to feeling less excited about the future of Daredevil now than I did two months ago, specifically as a result of Marvel’s communication strategy. It broke the spell, I suppose. Anyway, I can never hold a grudge for very long, so I guess I’ll work my way back to pre-daredevilocalypse levels of excitement before too long. And besides, I’m sure we’ll see some great stories in the next few months as well! Breaking: Matt Wilson new Daredevil colorist as of Daredevil #8! I hope the price hike means there will be a digital code. I thought it was looking more and more likely that the series would be re-launched but with a different team, but I’m glad that’s not the case. I was probably letting volume 3 critics influence me. Yes, there will be, as seen on the cover featured in the interview. Guess I’m becoming a grumpy old lady… or maybe I’m just old enough to have seen this type of thing too many times. Fashion keeps repeating, I suppose marketing trends must as well. Based on Waid’s comments I assumed a new relaunch was in order. Plus, DD is turning fifty. DD in San Fran tho? Aaaah, not excited by that prospect. DD is a New York guy. Hells Kitchen is a character in DD’s life. My understanding is when Marvel moved DD out west it didn’t go very well or it didn’t seem the same as DD in New York. You can move the xmen around and even the hulk and iron man, but DD? No. Just like Spidey, New York is another the character in their stories. Waid’s run has been very enjoyable so I will be tuning in! How could I not. DD yo! I personally do not mind the renumbering of the books. I get the strategy of making new volumes, because number 1’s sell better, and Marvel doesn’t make a nickel on the back/used market. You have to remind yourself that after the internet, you can always find the trail of the book, month after month. Before the internet, we needed the numbering to keep track, because we had no other way to know the order of reading. Now if you get lost, here is an easy link to keep up(http://comicbookdb.com/character_chron.php?ID=371). One of many websites out there. So in closing, I am just glad there is a new Daredevil book out each month(whether it is DD #549 or DD Vol 4 #1). I will keep reading. I’m excited that Waid and Samnee are remaining on the title but I could do without the relaunch. It’s a money-grabbing move by Marvel which I find frustrating. The price hike is also frustrating. I do buy quite a number of titles each month and having DD at $3.99 now is only to going to make the comic budget that much tighter. Like you I only get a handful of comics each month. Most of them are in digital format. Batman is one of my print subs and I’m thinking of dropping it at the end of the current arc. I may just replace it with this new run. I have all of Vol 3 in digital and with Marvel, unlike DC giving away the digital edition with purchase of print it makes more sense for me to buy this in print instead of Batman. If it were anyone but Waid moving DD to San Fran I would role my eyes, but this team has earned my trust … over and over again. Well, I’m out. The price increase is just too much for me. I have very little disposable income, and DD is one of only 3 comics I still buy monthly, but I’ll be dropping it after #36. Even if I could afford it I’d probably still drop it as I’m sick of these cynical, greedy moves from Marvel. I have no interest in digital comics. I’m very disappointed with this. Love your site. And I love this current run of Daredevil. Which is why the news of yet another rejig with another #1 came as a disappointment. Will any comic ever make it to #50 anymore? It appears my fears came true that Bendis, Quesada, et al, would come up for air from their ongoing Avengers/X-Men events and see this gem, ready to be maxed out. I also feared a price hike, and that appears to be happening as well. I’ll remain optimistic, but if my continued enjoyment of this comic means that in order to follow the storyline, I’ll have to shell out for multi-title crossovers, then I’ll likely drop it, if only out of economic concerns. Daredevil has proven thus far to be the perfect little comic. Given their track record, it appears that wasn’t good enough for Marvel editorial.